The close connection between the music philosophy of Theodor W. Adorno (1903–69) and the developments of the post-World War II musical avant-garde is as well known as it is complex. The influence went both ways: on the one hand, Adorno’s advocacy for the music of the Second Viennese School—his pointed criticism of twelve-tone technique notwithstanding—and his notion of “integral composition” constituted a strong force behind the proliferation of pluridimensional serial techniques. On the other hand, the paths taken by the musical avant-garde in the 1950s and 1960s drove Adorno continuously to revisit and expand his music philosophy. He tried to keep up with the most recent music and actively sought a critical dialogue with younger composers, but struggled at times to grasp the full extent of the latest advances in compositional technique and style. Among the locations where this dialogue took place were the “Internationale Ferienkurse für Neue Musik” in Darmstadt, where Adorno served on the faculty or appeared as guest speaker several times between 1950 and 1966 (Tiedemann 2001). In five of these summer courses, Adorno was invited to present a series of lectures, which have been preserved in live recordings at the International Music Institute in Darmstadt. While Adorno reworked the second through fourth lecture cycles into articles that are well known (with a full transcription of the fifth cycle published posthumously), the content of the often more extensive lectures themselves had remained inaccessible outside the archives until the recent publication of these talks under the title Kranichsteiner Vorlesungen (“Kranichstein Lectures”), part of the edition of Adorno’s unpublished texts issued by the Theodor W. Adorno Archive. Kranichsteiner Vorlesungen, superbly edited by Klaus Reichert and Michael Schwarz, presents transcriptions of Adorno’s mostly freely spoken talks. (Kranichstein is the name of the hunting castle where the Darmstadt courses initially took place, from 1946 on, outside the almost completely destroyed city.) The 672-page volume is copiously annotated with 353 often extensive footnotes. It reproduces the notes from which Adorno gave the first, second, and fifth lecture cycles, and concludes with an editorial afterword, index, and detailed list of topics for each lecture. Furthermore, the book is accompanied by a DVD that contains the audio recordings of the lectures. Kranichsteiner Vorlesungen features all multi-lecture series that Adorno gave at the Darmstadt festival; Figure 1 lists for each of these the year, title, number of lectures, and subsequent reworking in print, where applicable. (1) Not all of the lectures are documented in their entirety on the archival recordings, and hence in the editors’ transcriptions, due to tape changes or other circumstances. Most recordings last between 70 and 110 minutes each, adding up to over 24 hours of lecturing documented on the DVD. In what follows, I will survey a few of Adorno’s core arguments that run through these talks. Since virtually all of the topics are familiar, in one fashion or another, from Adorno’s writings, I will focus on how he presents his ideas in the Darmstadt context, on the occasionally provisional character of his argument, and on interesting details that Adorno eventually omitted from print versions of his talks. This edition is a real delight in how it brings alive the thought processes and arguments of the principal music philosopher associated with the Second Viennese School and the musical avant-garde. The recordings capture Adorno speaking quite slowly and choosing his words carefully, and while his sentences are often rather long, they are easier to follow than the characteristically long clauses in his writings because his vocabulary and sentence structures tend to be more straightforward in speech than in print. Occasionally, Adorno allows himself to put things more simply than befits an issue, or to choose a term that he says he would not use in writing, in order to move swiftly to the heart of a matter. He is quick at citing, seemingly spontaneously at times, specific musical features and passages to clarify a theoretical point, but he then sometimes omits such references later in the published version of an article, presumably for fear of underrepresenting the complexity of an issue. In the first two lecture series, Adorno demonstrates numerous musical examples at the piano, mostly from scores by Arnold Schoenberg. If ever anyone doubted Adorno’s musicality, these recordings of him performing excerpts from tonal and free atonal works with agility, superb touch, and evocative phrasing, as well as accompanying himself singing through songs by Schoenberg, will put such doubts to rest once and for all. Adorno—who, after his doctorate in philosophy in Frankfurt, had studied composition with Alban Berg and piano with Eduard Steuermann in Vienna from 1925 on—clearly loves this repertoire and is intimately familiar with it. He shows himself here at his best as a hands-on, practical music analyst when it comes to nuts-and-bolts analytical questions. He was critical of positivist music analysis and often shied away from it, but as we know from his monographs on Berg, Mahler, and Wagner and other writings, and as we can now witness here in his Darmstadt lectures, this was not for lack of analytical skill. The analyses he presents at the piano are generally straightforward to follow with the scores, which are easily available and not excerpted in this edition. Also not provided are transcriptions into staff notation of Adorno’s illustrations at the piano, where he alters a chord or a phrase in a passage in order to make an analytical point. Some of these illustrations are particularly insightful and I will discuss a few below. Adorno takes a special liking to what he calls “axial rotation” (“Achsendrehung”), by which he means either a permutation of pitches or intervals, or an arrangement of pitches around a fixed axis, and which he associates with the broader concept of developing variation and the interplay of unity and variety in Schoenberg’s music. An example is what Adorno describes as “an entirely new motive” in mm. 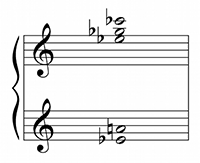 75–76 of Verklärte Nacht (Example 9), “which, however, is related to the first main theme” (Example 8b) through similar melodic intervals of minor seconds, augmented fourth/diminished fifth, and minor/major third (52; DVD, track 2, 14:43). (8) The “axis” in “Achsendrehung” may actually be a specific pitch, as Adorno suggests about the second violin of the fugato from the First String Quartet op. 7 (Example 10). He analyzes the second motive as a “rotated” version (“achsengedreht”) of the first (Example 11) around the stationary G3 shared by the two. Without spelling out the criteria for his choices, he states: “Whereby I would say: [Example 11, first motive] corresponds now to [Example 11, second motive]. [D4] corresponds to [C4], [C 4] corresponds to [A 4] and the [G3] in both is the same after all.”(9) Adorno clearly pairs pitches according to register here: C4 and D4 are the second-lowest pitches within their respective motives, and C 4 and A 4 are the highest pitches. In other words, the first motive is transformed into the second by a shift from C4 to D4 and from C 4 to A 4, as illustrated in Example 12. However, he does not seem to be interested in the fact that the second motive is an ordered pitch-class transposition (T7) of the first, a property that perfectly exemplifies the principle of unity within variety and that lends further support to Adorno’s observation that this motivic transformation “in principle is already somewhat reminiscent of row technique” (“prinzipiell auch schon an die Reihentechnik etwas erinnert,” 205). are more important than knowledge of the traditional forms as such, even though they have naturally developed out of the traditional forms and can always be found in them. [. . .] It [i.e., such a ‘material theory of form’] would not, to be sure, be fixed and invariable—it would not be a theory of form for once and always, but would define itself within itself historically, according to the state of the compositional material, and equally according to the state of the compositional forces of production (Adorno 2002, 177–78). Adorno concludes that “so far not even the beginnings of an approach have been made regarding such a ‘material theory of form’ (as opposed to the architectonic-schematic type of theory)” (Adorno 2002, 177), but I would argue that there are intimations in his Darmstadt lectures of how such an integral analysis could look. Many of the works that he discusses are ones that he has clearly analyzed for himself in their entirety, even though time did not permit him to deal with them fully. He has carefully considered an excerpt’s place and function within the entire work or movement and he specifically addresses this aspect when he does have the time to discuss entire movements, such as the first and fourth songs from Schoenberg’s op. 2, which he performs and comments on in their entirety. In op. 2, no. 1, for instance, Adorno discusses the “consequences” that the opening chord (Example 1) has for the rest of the song (30; DVD, track 1, 54:58). For him, the opening chord makes one “shiver” (“Schauer”), a sensation that cannot be triggered repeatedly by the same chord each time it reappears. 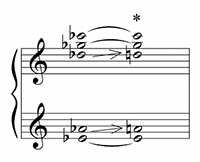 The song’s tension, which remains unsolved according to Adorno, thus consists in the conflict created by the chord’s repetition in various transpositions; the chord is both the same and not the same as the song progresses. Given its almost conversational style, its relatively slow pace, and its many musical illustrations, Kranichsteiner Vorlesungen can serve as a good introduction to Adorno’s music philosophy. We can sense at every turn Adorno’s reluctance to accept any answer that seems too straightforward, any procedure that makes composition too easy, or any analytical insight that does not take a holistic, dialectical approach. While Adorno’s greatest contributions remain largely speculative by their very nature—such as his visions of a “material theory of form” and an “informal music,” which propose solutions to the analytical and compositional problems he had identified over the course of his career—hearing him play and explain music does get us closer to what he was after. The lectures from 1956, 1957, and 1961 are often easier to understand than their published versions because the lectures are less dense and elliptical, and contain numerous clarifying examples as well as references to names that Adorno cut from the articles. (21) I would recommend reading these lectures before the corresponding articles. The editors’ meticulous transcriptions and annotations of Adorno’s talks in Kranichsteiner Vorlesungen are an impressive scholarly achievement and an invaluable addition to the Adorno literature. 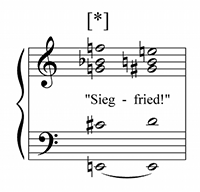 One would hope that an English edition of the volume might become available before long, perhaps accompanied by transcriptions of those of Adorno’s illustrations at the piano that go beyond what we can find in the printed scores—such as when, to the audience’s delight, he turns a passage from a Schoenberg song into a Wagnerian sequence (DVD, track 1, 1:28:00). Adorno, Theodor W. (1949) 2006. Philosophy of New Music, ed. and trans. Robert Hullot-Kentor. University of Minnesota Press. Adorno, Theodor W. (1954/55) 2002. “The Aging of the New Music,” trans. Robert Hullot-Kentor and Frederic Will. In Essays on Music, ed. Richard Leppert, 181–202. University of California Press. —————. (1954/55) 2002. “The Aging of the New Music,” trans. Robert Hullot-Kentor and Frederic Will. In Essays on Music, ed. Richard Leppert, 181–202. University of California Press. Adorno, Theodor W. (1957) 1‌978. “Die Funktion des Kontrapunkts in der neuen Musik.” In Gesammelte Schriften, vol. 16, ed. Rolf Tiedemann with Gretel Adorno, Susan Buck-Morss, and Klaus Schultz, 145–69. Suhrkamp. —————. (1957) 1‌978. “Die Funktion des Kontrapunkts in der neuen Musik.” In Gesammelte Schriften, vol. 16, ed. Rolf Tiedemann with Gretel Adorno, Susan Buck-Morss, and Klaus Schultz, 145–69. Suhrkamp. Adorno, Theodor W. (1957) 1999. “The Function of Counterpoint in New Music.” In Sound Figures, trans. Rodney Livingstone, 123–44. Stanford University Press. —————. (1957) 1999. 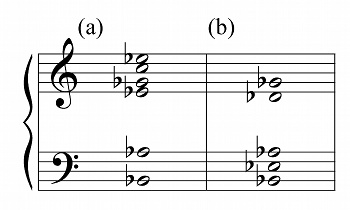 “The Function of Counterpoint in New Music.” In Sound Figures, trans. Rodney Livingstone, 123–44. Stanford University Press. Adorno, Theodor W. 1958. “Kriterien.” Darmstädter Beiträge zur Neuen Musik 1: 7–16. —————. 1958. “Kriterien.” Darmstädter Beiträge zur Neuen Musik 1: 7–16. Adorno, Theodor W. (1958) 19‌78. “Musik und Technik.” In Gesammelte Schriften, vol. 16, ed. Rolf Tiedemann with Gretel Adorno, Susan Buck-Morss, and Klaus Schultz, 229–48. Suhrkamp. —————. (1958) 19‌78. “Musik und Technik.” In Gesammelte Schriften, vol. 16, ed. Rolf Tiedemann with Gretel Adorno, Susan Buck-Morss, and Klaus Schultz, 229–48. Suhrkamp. Adorno, Theodor W. (1959) 197‌8. “Kriterien der neuen Musik.” In Gesammelte Schriften, vol. 16, ed. Rolf Tiedemann with Gretel Adorno, Susan Buck-Morss, and Klaus Schultz, 170–228. Suhrkamp. —————. (1959) 197‌8. “Kriterien der neuen Musik.” In Gesammelte Schriften, vol. 16, ed. Rolf Tiedemann with Gretel Adorno, Susan Buck-Morss, and Klaus Schultz, 170–228. Suhrkamp. Adorno, Theodor W. (1959) 1999. “Criteria of New Music.” In Sound Figures, trans. Rodney Livingstone, 145–96. Stanford University Press. —————. (1959) 1999. “Criteria of New Music.” In Sound Figures, trans. Rodney Livingstone, 145–96. Stanford University Press. Adorno, Theodor W. (1960) 1992. Mahler. A Musical Physiognomy, trans. Edmund Jephcott. University of Chicago Press. —————. (1960) 1992. Mahler. A Musical Physiognomy, trans. Edmund Jephcott. University of Chicago Press. Adorno, Theodor W. (1960/61) 1998. “Mahler.” In Quasi una Fantasia. Essays on Modern Music, trans. Rodney Livingstone, 81–110. Verso. —————. (1960/61) 1998. “Mahler.” In Quasi una Fantasia. Essays on Modern Music, trans. Rodney Livingstone, 81–110. Verso. Adorno, Theodor W. 1962. “Vers une musique informelle.” Darmstädter Beiträge zur Neuen Musik 4: 73–102. —————. 1962. “Vers une musique informelle.” Darmstädter Beiträge zur Neuen Musik 4: 73–102. Adorno, Theodor W. (1963) 1978‌. “Vers une musique informelle.” In Gesammelte Schriften, vol. 16, ed. Rolf Tiedemann with Gretel Adorno, Susan Buck-Morss, and Klaus Schultz, 493–540. Suhrkamp. —————. (1963) 1978‌. “Vers une musique informelle.” In Gesammelte Schriften, vol. 16, ed. Rolf Tiedemann with Gretel Adorno, Susan Buck-Morss, and Klaus Schultz, 493–540. Suhrkamp. Adorno, Theodor W. (1963) 1998. “Vers une musique informelle.” In Quasi una Fantasia. Essays on Modern Music, trans. Rodney Livingstone, 269–322. Verso. —————. (1963) 1998. “Vers une musique informelle.” In Quasi una Fantasia. Essays on Modern Music, trans. Rodney Livingstone, 269–322. Verso. Adorno, Theodor W. (1966) 1978. “Form in der neuen Musik.” In Gesammelte Schriften, vol. 16, ed. Rolf Tiedemann with Gretel Adorno, Susan Buck-Morss, and Klaus Schultz, 607–27. Suhrkamp. —————. (1966) 1978. “Form in der neuen Musik.” In Gesammelte Schriften, vol. 16, ed. Rolf Tiedemann with Gretel Adorno, Susan Buck-Morss, and Klaus Schultz, 607–27. Suhrkamp. Adorno, Theodor W. (1966) 2008. “Form in the New Music,” trans. Rodney Livingstone. Music Analysis 27 (2–3): 201–16. —————. (1966) 2008. “Form in the New Music,” trans. Rodney Livingstone. 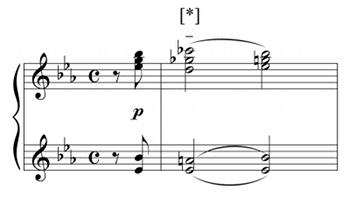 Music Analysis 27 (2–3): 201–16. Adorno, Theodor W. (1968) 1991. Alban Berg. Master of the Smallest Link, trans. Juliane Brand and Christopher Hailey. Cambridge University Press. —————. (1968) 1991. Alban Berg. Master of the Smallest Link, trans. Juliane Brand and Christopher Hailey. Cambridge University Press. Adorno, Theodor W. 1999. “Funktion der Farbe in der Musik (1966).” In Darmstadt-Dokumente I (Musik-Konzepte Sonderband), ed. Heinz-Klaus Metzger and Rainer Riehn, 263–312. edition text+kritik. —————. 1999. “Funktion der Farbe in der Musik (1966).” In Darmstadt-Dokumente I (Musik-Konzepte Sonderband), ed. Heinz-Klaus Metzger and Rainer Riehn, 263–312. edition text+kritik. Adorno, Theodor W. 2002. “On the Problem of Musical Analysis,” trans. Max Paddison. In Essays on Music, ed. Richard Leppert, 162–80. University of California Press. —————. 2002. “On the Problem of Musical Analysis,” trans. Max Paddison. In Essays on Music, ed. Richard Leppert, 162–80. University of California Press. Borio, Gianmario. 1993. Musikalische Avantgarde um 1960. Entwurf einer Theorie der informellen Musik. Laaber. Borio, Gianmario. 2015. Review of Kranichsteiner Vorlesungen, by Theodor W. Adorno, ed. Klaus Reichert and Michael Schwarz. Twentieth-Century Music 12 (2): 261–68. —————. 2015. Review of Kranichsteiner Vorlesungen, by Theodor W. Adorno, ed. Klaus Reichert and Michael Schwarz. Twentieth-Century Music 12 (2): 261–68. Borio, Gianmario, and Hermann Danuser, eds. 1997. “Chronik der Ferienkurse.” In Im Zenit der Moderne. Die Internationalen Ferienkurse für Neue Musik Darmstadt 1946–1966, with Pascal Decroupet, Inge Kovács, Andreas Meyer, and Wilhelm Schlüter, vol. 3, 513–638. Rombach Verlag. Boulez, Pierre. (1952) 1991. “Schoenberg is Dead.” In Stocktakings from an Apprenticeship, collected by Paule Thévenin, trans. Stephen Walsh, 209–14. Clarendon Press. Holtmeier, Ludwig. 2009. “Analyzing Adorno—Adorno Analyzing.” In Musiktheorie an ihren Grenzen: Neue und Alte Musik, ed. Angelika Moths, Markus Jans, John MacKeown, and Balz Trümpy, 69–84. Peter Lang. Holtmeier, Ludwig, and Cosima Linke. 2011. “Schönberg und die Folgen.” In Adorno-Handbuch. Leben—Werk—Wirkung, ed. Richard Klein, Johann Kreuzer, and Stefan Müller-Doohm, 119–39. J. B. Metzler. Metzger, Heinz-Klaus. (1958) 1960. “Intermezzo I (Just Who is Growing Old? ).” Die Reihe 4: 63–80. Tiedemann, Rolf. 2001. “Nur ein Gast in der Tafelrunde. Adorno in Kranichstein und Darmstadt 1950–1966.” Frankfurter Adorno Blätter 7: 177–86. Vande Moortele, Steven. 2015. “The Philosopher as Theorist: Adorno’s materiale Formenlehre.” In Formal Functions in Perspective. Essays on Musical Form from Haydn to Adorno, ed. Steven Vande Moortele, Julie Pedneault-Deslauriers, and Nathan John Martin, 411–33. University of Rochester Press. 1. Adorno appeared at the Darmstadt summer courses in other years as well: in 1950, the year after he returned from exile, and in 1951, he served on the faculty teaching courses in music criticism (“Musikkritik”) and “free composition” (“Arbeitsgemeinschaft für freie Komposition”), respectively. In 1951 he also gave a talk on Webern at the Second International Twelve-Tone Congress that took place during the summer courses, as well as a talk on “Music, Technology, and Society” (“Musik, Technik und Gesellschaft,” incorporated in Adorno  19‌78). In 1954 he taught a course together with violinist Rudolf Kolisch and pianist and composer Eduard Steuermann on new music and performance (“Neue Musik und Interpretation [mit musikalischen Demonstrationen]”), and in 1965 he opened the Darmstadt festival with a lecture on “Form in New Music” (“Form in der Neuen Musik”), first published in the following year (Adorno  1978, English translation in Adorno  2008). These single lectures are not included in Kranichsteiner Vorlesungen. The programs of the Darmstadt courses of 1946–66 are listed in Borio and Danuser 1997. 2. The most incisive contemporary critique of Adorno’s article is Metzger  1960. 4. For an analysis and critique of Adorno’s concept of “informal music,” see Borio 1993, particularly 102–18 and 168–73. 5. “Mit anderen Worten also, der Akkord ist in Wirklichkeit bereits ein quartiger Akkord, und er wäre am allereinfachsten zu erklären: [Example 5] als eine Alteration dieses Quartenakkords nach oben” (28). 6. The issue of “historical tendencies” is complex, however, as Adorno explains in the context of the “problem of historicism” in the 1957 lectures (254–55). 7. Adorno tends to praise composers who can do without sequences, such as when he speaks of Mahler’s “critical vigilance against empty formality like that of Bruckner’s sequences” (Adorno  1992, 67). 8. “Bei ‘Etwas belebter’ auf Seite 10 kommt ein neues, ein ganz neues Motiv, das allerdings verwandt ist mit dem ersten Hauptthema” (52). As the page reference here suggests, Adorno likely played his examples directly from the full score. Gianmario Borio, in his review of Kranichsteiner Vorlesungen, points out an example of Adorno using “axial rotation” to mean, in the terminology of post-tonal theory, a transposed permutation of an ordered pitch-class set (Borio 2015, 264). 9. “Wobei ich sagen würde: Es entspricht sich [Example 11, first motive] und nun das [Example 11, second motive]. Das [D4] und das [C4] entspricht sich, das [C 4] und das [A 4] entspricht sich und das beidermalige [G3] ist doch dasselbe” (205–6). 10. “Since the music has been composed from the bottom up, it must be heard from the bottom up” (Adorno [1960/61] 1998, 87). 11. In his monograph on Berg, Adorno likewise emphasizes the need to analyze a work in both directions, from its totality to its details and vice versa: “In a compositional process in reverse, as it were, beginning with the end product, it is necessary to determine the objective properties of a composition’s quality by immersing oneself in the work as a whole and its microstructure” (Adorno  1991, 35). 12. For a recent discussion of Adorno’s “material theory of form,” see Vande Moortele 2015. On Adorno’s analytical practice and its background, see Holtmeier 2009 and Holtmeier and Linke 2011. 21. Space does not allow me to illustrate this here, but interested readers may want to compare the following passages, for instance: 144–46 with Adorno  1‌978, 166 (on the problem of twelve-tone counterpoint); 334 with Adorno  197‌8, 206 (where readers of the article are purposely left in the dark as to whose string quartet Adorno is talking about—the lecture identifies it as that of Hans Erich Apostel); 311 with Adorno  197‌8, 196–97 (explanation of “[qualitative] level of form” [“Formniveau”]); and 437 with Adorno  1978‌, 504 (Adorno names the serial composer he is criticizing, Karel Goeyvaerts, in the lecture but not in the article). Occasionally, however, Adorno worked additional details into an article version, as in his discussion of technical features of Wozzeck (compare 370 with Adorno  197‌8, 220). Adorno appeared at the Darmstadt summer courses in other years as well: in 1950, the year after he returned from exile, and in 1951, he served on the faculty teaching courses in music criticism (“Musikkritik”) and “free composition” (“Arbeitsgemeinschaft für freie Komposition”), respectively. In 1951 he also gave a talk on Webern at the Second International Twelve-Tone Congress that took place during the summer courses, as well as a talk on “Music, Technology, and Society” (“Musik, Technik und Gesellschaft,” incorporated in Adorno  19‌78). In 1954 he taught a course together with violinist Rudolf Kolisch and pianist and composer Eduard Steuermann on new music and performance (“Neue Musik und Interpretation [mit musikalischen Demonstrationen]”), and in 1965 he opened the Darmstadt festival with a lecture on “Form in New Music” (“Form in der Neuen Musik”), first published in the following year (Adorno  1978, English translation in Adorno  2008). These single lectures are not included in Kranichsteiner Vorlesungen. The programs of the Darmstadt courses of 1946–66 are listed in Borio and Danuser 1997. The most incisive contemporary critique of Adorno’s article is Metzger  1960. For an analysis and critique of Adorno’s concept of “informal music,” see Borio 1993, particularly 102–18 and 168–73. “Mit anderen Worten also, der Akkord ist in Wirklichkeit bereits ein quartiger Akkord, und er wäre am allereinfachsten zu erklären: [Example 5] als eine Alteration dieses Quartenakkords nach oben” (28). The issue of “historical tendencies” is complex, however, as Adorno explains in the context of the “problem of historicism” in the 1957 lectures (254–55). Adorno tends to praise composers who can do without sequences, such as when he speaks of Mahler’s “critical vigilance against empty formality like that of Bruckner’s sequences” (Adorno  1992, 67). “Bei ‘Etwas belebter’ auf Seite 10 kommt ein neues, ein ganz neues Motiv, das allerdings verwandt ist mit dem ersten Hauptthema” (52). As the page reference here suggests, Adorno likely played his examples directly from the full score. 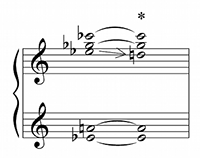 Gianmario Borio, in his review of Kranichsteiner Vorlesungen, points out an example of Adorno using “axial rotation” to mean, in the terminology of post-tonal theory, a transposed permutation of an ordered pitch-class set (Borio 2015, 264). “Wobei ich sagen würde: Es entspricht sich [Example 11, first motive] und nun das [Example 11, second motive]. Das [D4] und das [C4] entspricht sich, das [C 4] und das [A 4] entspricht sich und das beidermalige [G3] ist doch dasselbe” (205–6). “Since the music has been composed from the bottom up, it must be heard from the bottom up” (Adorno [1960/61] 1998, 87). In his monograph on Berg, Adorno likewise emphasizes the need to analyze a work in both directions, from its totality to its details and vice versa: “In a compositional process in reverse, as it were, beginning with the end product, it is necessary to determine the objective properties of a composition’s quality by immersing oneself in the work as a whole and its microstructure” (Adorno  1991, 35). For a recent discussion of Adorno’s “material theory of form,” see Vande Moortele 2015. On Adorno’s analytical practice and its background, see Holtmeier 2009 and Holtmeier and Linke 2011. Space does not allow me to illustrate this here, but interested readers may want to compare the following passages, for instance: 144–46 with Adorno  1‌978, 166 (on the problem of twelve-tone counterpoint); 334 with Adorno  197‌8, 206 (where readers of the article are purposely left in the dark as to whose string quartet Adorno is talking about—the lecture identifies it as that of Hans Erich Apostel); 311 with Adorno  197‌8, 196–97 (explanation of “[qualitative] level of form” [“Formniveau”]); and 437 with Adorno  1978‌, 504 (Adorno names the serial composer he is criticizing, Karel Goeyvaerts, in the lecture but not in the article). Occasionally, however, Adorno worked additional details into an article version, as in his discussion of technical features of Wozzeck (compare 370 with Adorno  197‌8, 220).